Elegant living, indoors and outdoors; dining in gourmet style, or dining out in the glow of the sunset or by candle light. 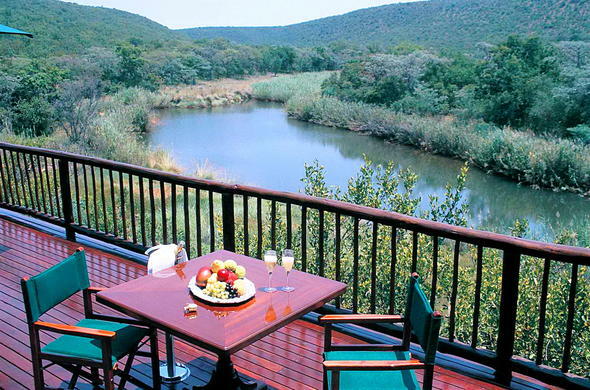 Witwater is a game reserve in the scenic malaria free Waterberg, Limpopo Province. It is an easy 2-hour drive from Pretoria, South Africa. The 5 star Witwater Lodge is set on the banks of the lush Phalala River with its white waters, from where Witwater gets its name. The imposing, thatched Witwater Lodge has a stylishly decorated lounge and en-suite bedrooms upstairs. The elegant dining room and bar opens onto an expansive pool deck with sweeping views across the river. Linked by wooden walkways, luxury East African safari style tents on wooden decks are spaced out along the riverbank for privacy. Gourmet chefs offer cuisine at its best and meals may be enjoyed in the dining room, outdoors in the boma (grass hut) or in the bush. Relax on game drives in this wildlife sanctuary spotting Rhino, Buffalo, Giraffe, Sable, Eland and many more including the elusive Leopard. The birdlife is in abundance at Witwater Lodge. Unwind with a relaxing health treatment at the Spa or enjoy bush walks, archery and clay pigeon shooting.